The primary mission of Davidson County Schools is to ensure your child receives the best education possible. The goal of our team of dedicated professionals is to work closely with both you and your child to see that this mission is accomplished. We encourage you to visit your child's school and meet with our team of teachers, administrators, and staff who are there to help. We understand that you are your child's first teacher, and we need a strong cooperative partnership between you and the school team to ensure that your child reaches his or her ultimate potential. Feel free to ask for a conference with your child's teacher(s), counselors, or principal at any time. Stay informed! 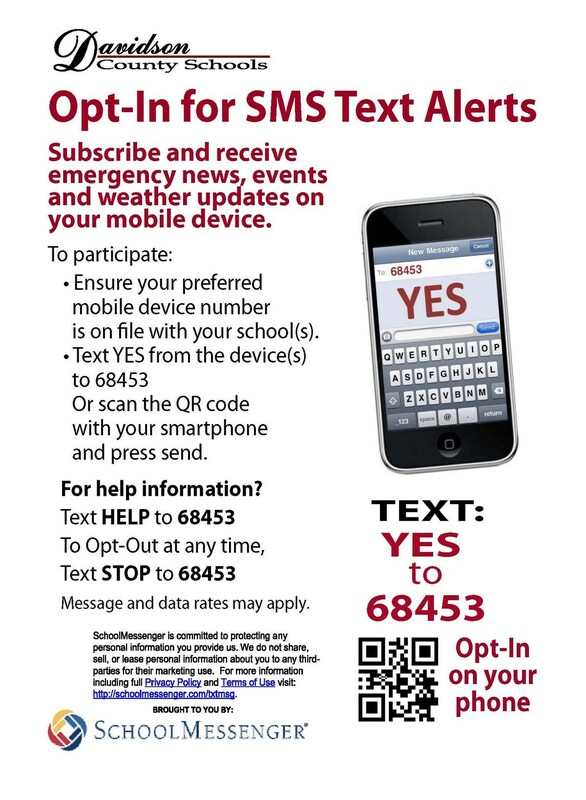 Please follow the directions below to opt in for SMS text alerts from Davidson County Schools. We are happy that you are a part of our wonderful school system and look forward to partnering with you to ensure your child's success!